We are leading manufacturer and supplier of Effluent Treatment Chemical. Reckoned as leaders in this domain, we are offering excellent quality Effluent Polymer. 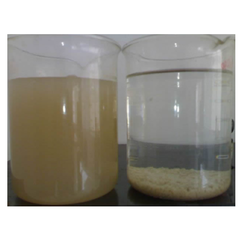 The offered polymer is extensively demanded in the process of water treatment. This polymer is processed using quality examined chemical compounds and modern technology under the direction of adroit troop of professionals. Besides, we assure that the provided polymer is tested on diverse parameters to meet set market norms. Looking for Effluent Treatment Chemical ?